To submit videos to be featured on Voice of One's blog, just send an e-mail with the link to VoiceOfOneACappella@gmail.com OR post it in the comments section on our homepage blog! Eventually we here at Voice of One would like to compile the best of the best OPAC tracks for a digital album. While that day is not today, if you are an artist and would like to submit a track now, you can do so by reading the guidelines below. Or just e-mail for more information. To submit your track for consideration Voice of One's digital album, it must meet the following requirements. The person submitting the track is notated below as "creator". The Vocals (all parts, including background and soloist) and Arrangement must be done by the creator. Vocal Percussion can be one other person, however it is encouraged that the creator also does vp. The song can be from any artist of any genre, but at this time must be in English. Songs can be no longer than 5 minutes long. All work- arranging, recording, editing, mixing, and producing must be completed by the creator. The ability to hire someone to do this work creates an unfair financial advantage over others. There is a maximum of three submissions per creator. All licensing of tracks must be done by creator. Songs can be either covers or originals. 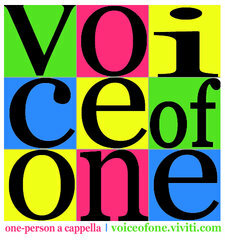 Submissions should be sent to VoiceOfOneACappella@gmail.com. Good Luck and Have Fun!